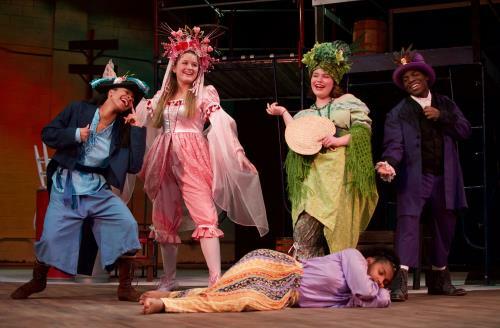 In the Chattanooga Theatre Centre production of “Once on This Island, Jr.,” Ti Moune (MaKenzie Ballard) is found alone following a massive storm by the fantastical gods who rule the island. From left are the God of Water Agwe (Zoe Chatman), the Goddess of Love Erzulie (Ava Culpepper), Mother of the Earth Asaka (Genna Rayborn), and Demon of Death Papa Ge (Kevin Bennett). With its catchy Caribbean-flavored musical score and vibrant costumes splashing the stage with color, the Chattanooga Theatre Centre’s upcoming Youth Theatre production of “Once on This Island, Jr.” may just conger up orange sunsets and ocean breezes when this enchanting Calypso folktale opens Saturday, Feb. 2. Adapted for young audiences from the celebrated Broadway musical, with music and lyrics by the legendary writing team of Stephen Flaherty and Lynn Ahrens, the CTC production of “Once on This Island, Jr.” features a multicultural cast of 30 young people under the direction of Youth Theatre Director R. Scott Dunlap. The show runs through Sunday, Feb. 10. Like the Hans Christian Anderson fairy tale “The Little Mermaid” on which it is based, the young lovers live in twodifferent worlds. The tale is as timely as ever though, as it follows Ti Moune, who is orphaned and alone following a massive storm. When she falls in love with Daniel, “Once on This Island, Jr.” brings timeless themes of race and class into the story. Public performances take place on February 2, 3, 9 and 10 at 2:30 p.m. School performances are scheduled during the week of Feb. 4. The show is appropriate for 3rd grade and up. Tickets are available at the CTC box office at 267-8534 or online at TheatreCentre.com.